Cracked teeth can be painful, unattractive, and expensive to repair. 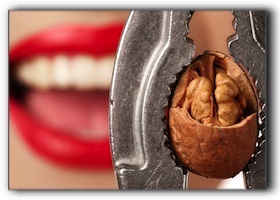 Today’s post in the Vitangeli dental blog contains an easy-to-follow list of tips to keep your teeth whole and strong. 1. Avoiding a cracked tooth means avoiding chewing on hard things. Mind-blowing, right? Clayton and Union dental patients should steer clear of ice, hard candies, hard nuts, popcorn, and beef jerky. Also be careful with pitted fruits – that peach may be soft but if you bite hard into the stone, you could damage a tooth. 2. It is critical to protect your teeth while engaging in any physical activity where you mouth can be hit. If you enjoy pick-up basketball games, indoor soccer leagues, Vandalia rec center flag football, and many other activities, you should be using a well-fitting mouth protector. 4. Most people know that grinding your teeth is harmful, but did you know that it can lead to a cracked tooth? If you know or suspect that you are a tooth grinder, speak with your Dayton dentist so you can address the problem with stress reduction techniques and/or a mouth guard. Frequent headaches or jaw pain can typically be attributed to nighttime teeth grinding. And more! If you live in Englewood, Clayton, Union, or Vandalia, and are seeking a friendly, experienced, and gentle dentist, please give us a call at 937-836-3565 to schedule a consultation.